PE35018 set is designed for Dragon (DML) Panzerkampfwagen IV Ausf.G model in 1/35 scale. The set is packed in a Voyager's usual thick paper compact disc case. 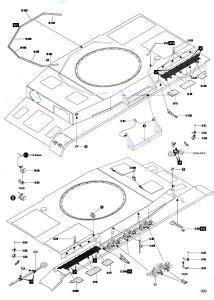 Inside the case are instructions printed on two A4 size paper sheets and a resealable plastic bag with all parts inside. 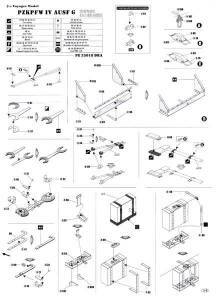 Instructions diagrams are simple and clear. 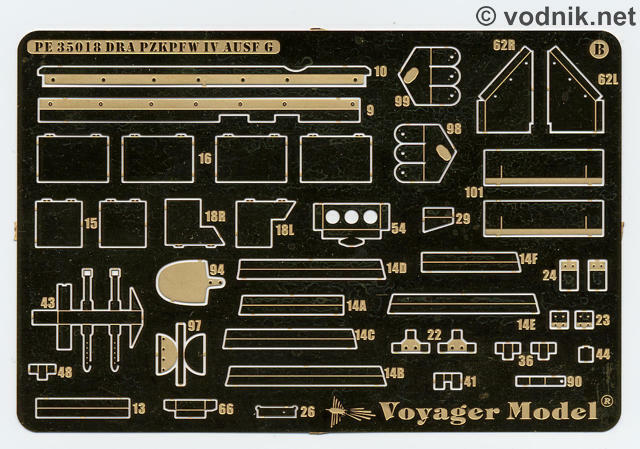 On the last page of instructions are pictures of PE parts attached to unfinished model and ads of two other Voyager update sets for Pzkpfw.IV: side skirts 35016 and fenders 35017. 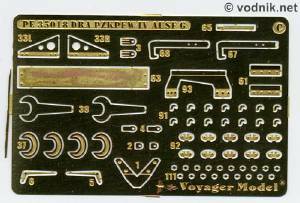 Three frets of photoetched parts are included, all made of brass. Smallest fret is slightly thicker than two larger ones. Aside from PE parts we also get one 0.5mm diameter ABS rod. Click on picture to enlarge it. 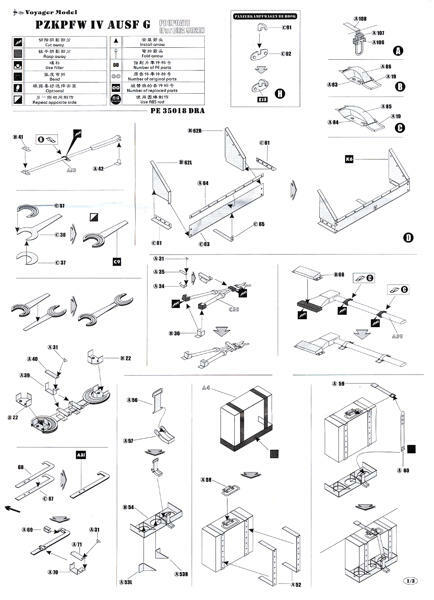 First page of instructions. Click on picture to enlarge it. 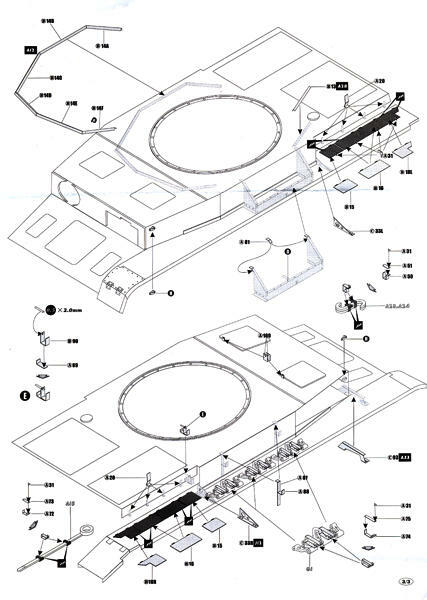 Third page of instructions. The length of 0.5 mm ABS rod is 53 mm. - brackets for spare track links, each with tiny separate butterfly nuts. 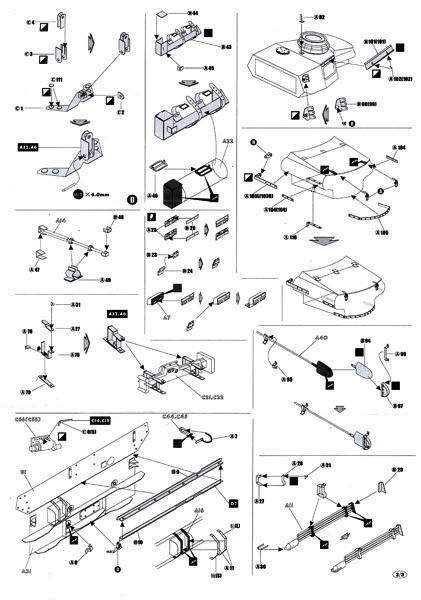 - multipart clamps and brackets for pioneer and service tools. 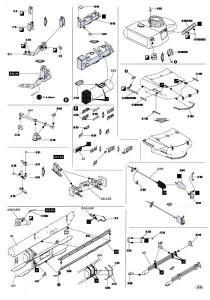 Some complete tools are also provided as PE parts. - storage box for left fender. - fender support brackets and covers. 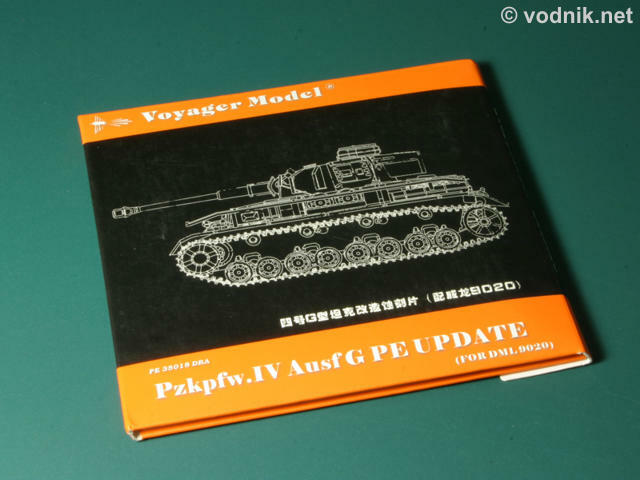 - a lot of other details for hull and turret, which are hard to identify and describe without detailed knowledge about real Pzkpfw.IV and Dragon model. Click on picture to enlarge it. Photoetched fret B. 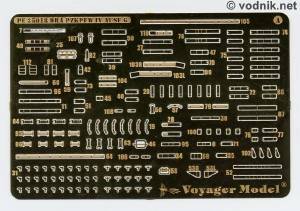 This is another interesting detail set from Voyager. 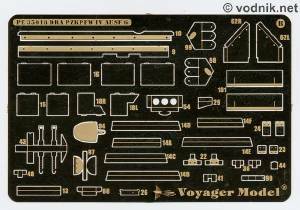 It is not as comprehensive as some other Voyager products, as this time Chinese company decided to offer several separate sets for one model kit and parts like side skirts and fenders are available in other sets. 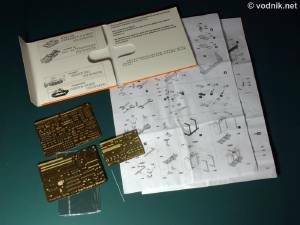 Here we once again get a lot of tiny parts: butterfly nuts, bolt heads, lifting hooks etc.. Some parts have to be assembled from many very small brass pieces, so it is not easy to build set and can be only recommended for more advanced modelers. 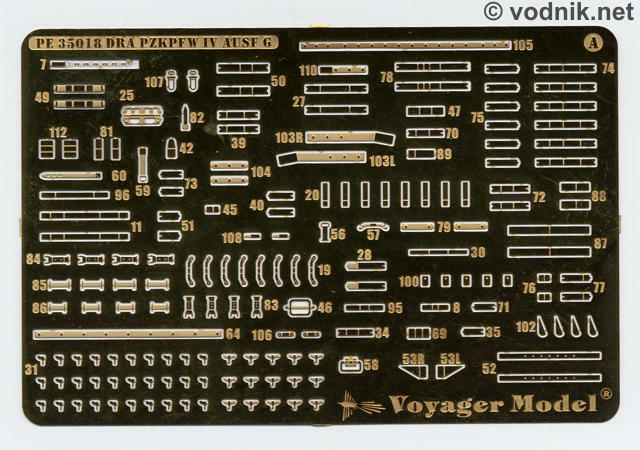 It looks now like all Voyager sets are like this, but actually there is really few PE sets on the market at all, which are suitable for beginners - Tamiya ones are probably rare exceptions. 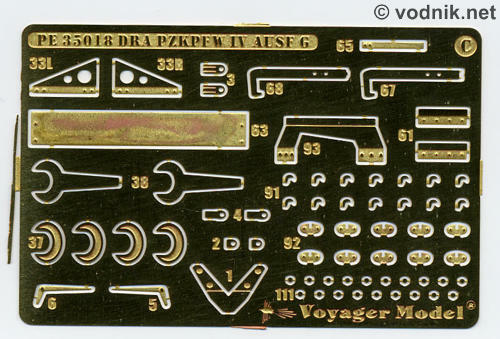 Once again I cannot comment on accuracy of parts in this set, as I'm a modern armor modeler and my knowledge of WW2 armor is marginal, but complexity and amount of details included would definitely improve the look of Dragon's Panzer IV.